Liver Cancer begins when precancerous liver cells start growing out of control. Eventually, the abnormal cells in the liver will develop benign (hemangioma, hepatic adenoma, focal nodular hyperplasia) tumors and malignant (hepatocellular carcinoma, intrahepatic cholangiocarcinoma, hemangiosarcoma, angiosarcoma, hepatoblastoma) cells. Some cancers in the liver are actually secondary conditions where cancers from other areas of the body, like the lung, breast, stomach, colon or pancreas spread from their primary (original) site into the liver. The rate of liver cancer diagnoses has been on a significant rise in recent years. Every year, nearly 30,000 individuals are diagnosed with liver cancer in the United States (approximately 21000 men/8000 women), and nearly 24,000 succumb to the disease. Doctors, scientists, and researchers have yet to determine the exact cause of every form of liver cancer. However, in many cases, the cause is obvious. As an example, hepatitis viruses involving chronic infections has a direct correlation with liver cancer. Doctors do know that liver cancer is the result of developmental mutations (changes) in the liver cell’s DNA. Unlike a normal healthy cell that grows, divides (reproduces) and dies over a typical lifespan, abnormal cells do not die and instead continually reproduce mutated cells growing at such an accelerated rate that it eventually forms a cancerous tumor. Diabetes – Individuals suffering from blood sugar disorders have a higher risk of developing liver cancer compared to individuals without diabetes. 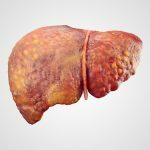 Heredity – Individuals who inherit specific liver diseases from their parents and ancestors including Wilson’s disease and hemochromatosis have an increased risk of developing cancer of the liver. Chronic HCV or HBV Infection – Acquiring chronic infections involving HBV (hepatitis B) virus or HCV (hepatitis C virus) can increase the potential of liver cancer. Cirrhosis – This irreversible and progressive disease forms scar tissue in the liver, which can increase the potential risk of developing liver cancer. Aflatoxin Exposure – Poisonous aflatoxin occurs when mold grows on poorly stored crops including peanuts and corn that are eventually used to make food products. Aflatoxin contamination tends to occur at higher rates in Asia and Africa. Non-Alcoholic Fatty Liver Disease – Individuals who accumulate fatty deposits in the liver tend to have a higher potential of developing liver cancer. Excessive Alcohol Consumption – Drinking alcohol every day at a higher than typical amount over many years has the potential of causing irreversible liver damage and cancer of the liver. Other liver cancer symptoms also include abnormal bleeding or bruising, enlarged veins appearing on the surface of belly skin, and fever. Hypercalcemia (high levels of blood calcium) often recognized as muscle problems, weakness, constipation, confusion or nausea. Having one or all of the symptoms does not necessarily verify the presence of liver cancer, because they may be caused by other conditions including a different liver condition. Even so, it is essential to seek out immediate medical attention to detect any problem and receive treatment if necessary. Blood Tests – A comprehensive blood panel test can uncover many of the function abnormalities associated with liver cancer. Imaging Tests — Magnetic Resonance Imaging (MRI) and Computerized Tomography (CT) scans can assist the doctor in their diagnosis by revealing the size, shape, and condition of the liver through images. Biopsy – To obtain a definitive diagnosis of the disease, the doctor may recommend a biopsy and remove a portion (sampling) of liver tissue to be sent off to the laboratory. A biopsy is an invasive procedure where a needle is inserted through the skin and into the liver. After the doctor reaches a diagnostic conclusion that the individual has liver cancer, they will stage the disease to determine the extent of damage the cancer has caused. Staging determines the location and size of the disease and if it is spreading (metastasizing) to other areas of the body. Typically, the doctor will stage the disease using letters “A through D” or Roman numerals from “I through IV”, where Stage D or IV identifies the liver cancer in its most advanced stage. Surgery – Often, removing the tumor and surrounding tissue is the best solution. However, surgical options often depend on the cancer’s location inside the liver, the patient’s overall health and how well the liver is functioning. Localized Treatments – Freezing cancer cells, injecting chemotherapy medication into the liver, injecting alcohol into the liver tumor and placing radiation beads inside the liver have all been proven to be effective treatments for liver cancer. Radiation – Bombarding cancer cells with high-powered energy is known to instantly kill the cancerous cells while shrinking tumors. External beam radiation therapy and stereotactic radiosurgery have been proven highly effective at killing liver cancer cells. Targeted Medication Therapy – The use of specific medications has been proven effective at interfering with tumor growth and stopping or slowing advanced hepatocellular carcinoma. Alternative Medicine – Doctors will often recommend alternative medicine treatments including acupressure, acupuncture, massage, music therapy and deep breathing in lieu of using pain medications. Palliative (Supportive) Care – At some point, the doctor will likely recommend palliative care to provide relief from pain associated with the condition. Liver Transplant – Some liver cancer patients are ideal candidates for obtaining a liver transplant. Other times, liver transplant surgery is the only viable option for individuals suffering from liver cancer in its early stage. Scientists continue to search for better answers of preventing liver cancer and improving treatments tat can improve survival rates and enhance the patient’s quality of life.